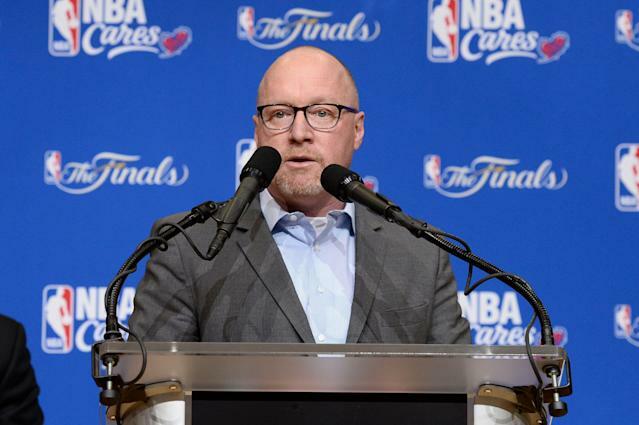 The New Orleans Pelicans have reached an agreement with former Cleveland Cavaliers general manger David Griffin to become president of basketball operations, ESPN’s Adrian Wojnarowski reports. Griffin was named general manager in Cleveland in 2014 and oversaw three straight NBA Finals appearances including the 2016 NBA championship. The Cavaliers declined to renew his contract after the 2017 season. He will take over basketball operations in New Orleans at a critical juncture with anticipated trade talks over Anthony Davis looming. Griffin was hired as acting general manager Danny Ferry pulled his name out of the running for the job, according to the report. "I let the Pelicans know throughout the process that for a few reasons, the timing wasn't right for my family to move full-time to New Orleans," Ferry told ESPN. "It's a great job and deserves a full-time focus. I have had a great experience with the Pelicans. I am happy to stay on to help them continue with the transition and to consult the next head of basketball operations if so desired." The Pelicans will presumably court offers for Davis this offseason in what is expected to be a bidding war for the All-NBA center.